Celebrex is a prescription painkiller for sufferers of severe joint pain and inflammation from conditions such as arthritis. Celebrex is part of a group of medications called nonsteroidal anti-inflammatory (NSAID) drugs. They work by interfering with particular enzymes in your body that cause inflammation and the pain that accompanies it. As Celebrex is taken when needed, you don’t need to complete a course. Follow the instructions given to you by your prescriber and do not exceed the stated dose. Take recommended dose of Celebrex when needed. Swallow capsule whole with a glass of water or milk. 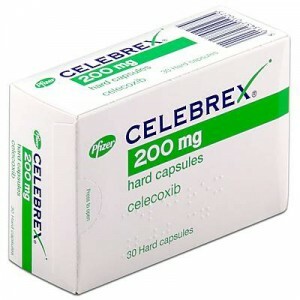 Celebrex capsules are available in two dosages: 100 mg and 200 mg.
Celebrex can cause side effects. It is important to understand the risks of the medication before taking it. If you are concerned about or experience any of these side effects, contact your GP. Do not hesitate to seek immediate medical attention should you experience one of the more serious side effects of this medication. You can also ease the symptoms of arthritis by ensuring affected joints are covered from the extremities and are not subjected to extreme heat or cold. Warm baths and natural essential oils can complement your prescription medication allowing you to enjoy the ease of painful joints associated with arthritis. Celebrex reduces the swelling associated with certain types of arthritis, but we have other prescription pain relief products available. Please see our arthritis page or prescription pain relief for more information. Celebrex can cause irritation if taken on an empty stomach, so is best taken with food or milk. We always want to keep you safe when you order prescription medicines from Prescription Doctor, and we will take every step to ensure you are well-informed. Make sure you complete the online consultation and disclose any relevant information so our registered prescriber can ensure the treatment is right for your condition. Be sure to mention all the medication you are currently taking, as well as any underlying medical conditions you have, during the online consultation so that our prescribers can issue the appropriate dose for you. It is recommended that you avoid alcohol while taking Celebrex. Celebrex may also react negatively with some other medications such as SSRIs. Always read the patient information leaflet supplied. Read all the patient information leaflet carefully before you start taking this medicine. Can celebrex make you sleepy? Celebrex can make you feel drowsy. If you become sleepy or dizzy as a result of taking celebrex, do not drive or operate machinery. How much celebrex can you take in a day? You should not take more than 400 mg of celebrex a day. Can I take other painkillers with Celebrex? Celebrex can be taken with paracetamol and other opioid painkillers such as co-codamol. Taking aspirin with celebrex may increase the risk of adverse cardiovascular events, stomach ulcers and stomach bleeding. Celebrex must not be taken with other NSAIDs such as Ibuprofen. You can buy Celebrex online without prescription from Prescription Doctor. We’ve made it very easy for you to order your pain relief through Prescription Doctor so you could receive your order by tomorrow. Once your order is approved by our online UK registered prescriber it will be sent to our pharmacy for dispatch. This is when you will receive an email with a tracking number so you can follow your parcel from our pharmacy to your door. A one hour delivery window ensures you don’t have to rearrange your whole life to wait in for your medication. All of our products are wrapped in two layers of protection that sports no livery of Prescription Doctor. This completely plain packaging ensures your products are private and hidden from view of family members or the delivery driver. If you have any questions at all about your prescription pain relief please contact us or visit our FAQs. You can easily buy Celebrex online without prescription from Prescription Doctor. Service Review: No issues whatsoever. Would use again.